Ocelots are native to Central and South America with a small population still residing in the southwestern United States. Ocelots are excellent climbers and live most of their lives in trees. They have a very distinct odor that they spray to mark their territory. This odor is water-resistant so that rain cannot easily wash it away. On average, ocelots live about 12 years in the wild. In captivity, they can live up to 20 years. Ocelots are typically 20 to 39 inches long with a tail that is 12 to 18 inches long. They weigh between 25 and 35 pounds. Ocelots have very distinctive chain-like rosettes and spots on their body. They have dark markings around their eyes to help pull in the light at night so they can see. Ocelots have white spots on the backs of their ears like all other spotted wildcats. These spots are used to communicate with their young. If the kittens cannot see the white spots on the backs of their mother’s ears while following her, it is an indication to them to go hide. Ocelots are nocturnal and solitary and live primarily in trees. Ocelots, although able to purr, generally make just one sound; it is a low growl. They make this sound regardless of their mood. Ocelots are adaptable; they can live in a variety of habitats. They are able to live in drier climates as long as a suitable water source is easily accessible. 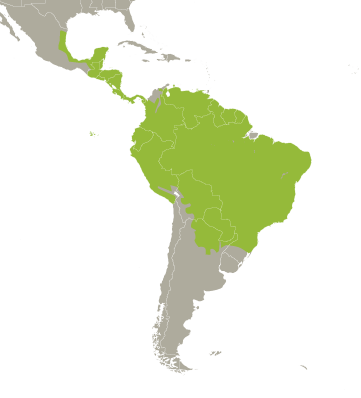 Due to hunting, they now primarily live in the rainforests of Central and South America. The ocelot's primary threat is humans. They were hunted to near-extinction in the United States in the 70’s for their fur. It takes between 30 and 35 full-grown ocelots to make just one fur coat. Ocelots are adaptable; they are able to live in a variety of habitats. 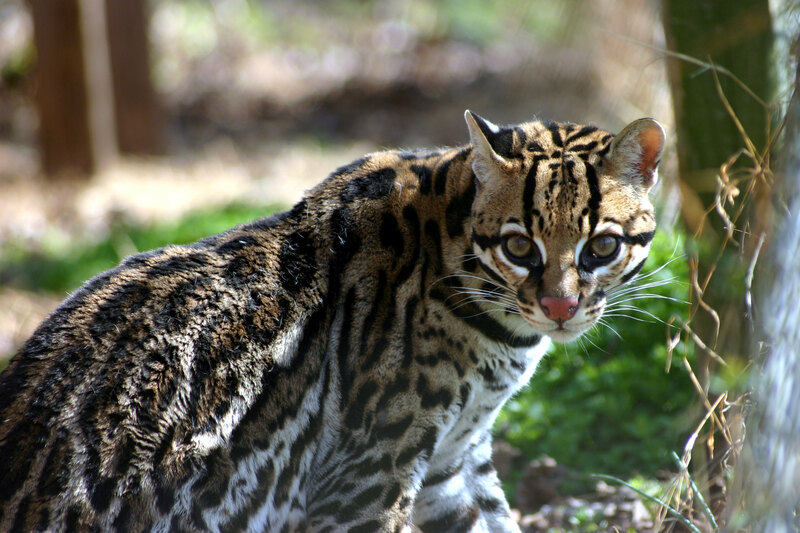 Ocelots once had a larger population residing in the southwestern United States but, due to hunting, they now primarily live in the rainforests of Central and South America. Ocelots are opportunistic hunters and eat a variety of prey, including deer, bats, small rodents, monkeys, birds, and lizards. An ocelot’s gestation period is between 79 and 85 days. They have an average of three kittens per litter but at times have just one or two. Females are able to breed at the age of two whereas males are able to breed at two and a half years. Ocelots are nocturnal, resting in trees or underbrush during the day and doing majority of their hunting at night. They are opportunistic hunters and will hunt anything that comes by them. At night, they will travel up to five miles to patrol their territory. Unlike most cats, ocelots do not shy away from water and are able to comfortably swim. Ocelots were hunted to near-extinction in the United States for their fur. Due to national legislation, ocelots are now protected and their numbers have started to slowly climb again. Their main threat now is loss of habitat due to deforestation.